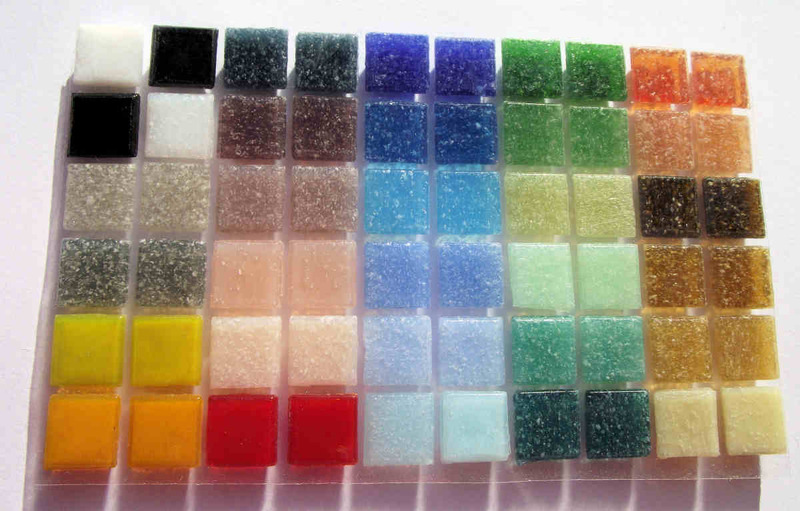 This sample of small, colourful vitreous glass mosaic tiles is supplied as a film backed set of some of our most popular colours in the standard 10mm tile range. Our Home Studio crafted mosaics will brighten up walls and floors, indoors or outdoors. This sample is intended to help prospective buyers of our mosaics to preview the finished effect. It is made from 60 tiles in 31 colours, with a nominal size of 109mm wide x 65mm high (approx 4 x 2.5 inches). Although this shop is for UK customers only, this can be posted to Europe, USA, Canada, Australia and other countries - use the quote button on the right to ask for a quote. The sample tiles are supplied attached to an adhesive transparent film at the spacing used for our mosaic products, giving some impression of the appearance of a finished mosaic. You can always try mounting and grouting the samples onto a test surface for the full effect. Should one or more of the colours appeal to you as potential border/background colours for your mosaic design, we can identify the colour from it's position on the grid and help incorporate them into your design. Tiles can be easily removed from the film by peeling - the individual colour loose tiles may help with colour matching and visualisation. 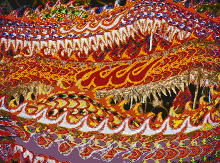 No of Tiles: 60 tiles (10 wide x 6 high) in 31 colours. Mosaic Size: 109mm x 65mm nominal (approx 4 x 2.5 inches). 10mm x 10mm x 3-4mm thick vitreous glass tiles, fired to a high temperature for strength and durability, they are frost proof and waterproof, UVA, shatter and fade resistant. The top of the tiles are bevelled around the edges for a low-slip finish, and have shaping on the back for excellent adhesion. This makes them suitable for use inside and outside, including home/office walls and floors, garage and garden walls, paths, patios and swimming pools. The sample mosaic tiles are supplied pre-prepared in sheet form with a transparent film sheet applied to the top of the tiles. 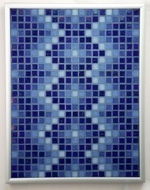 This maintains the tile arrangement in transit to show the position and orientation of tiles within a typical mosaic design. This film can be easily peeled off, if required. Standard Delivery is Free to all of the UK by Royal Mail. 'In Stock' typical dispatch: 0-1 working days, 'Made to Order' typical dispatch: 1-2 working days. Typical transit time: 2-3 working days.